Great Addition to the Series!!! ***4.5 out of 5 stars*** I’m a huge fan of Jennifer Estep. I countdown until each of her books are released and devour them as soon as they hit my kindle. I love her Elemental Assassin series for adults and have completely fallen in love with her YA Black Blade series. 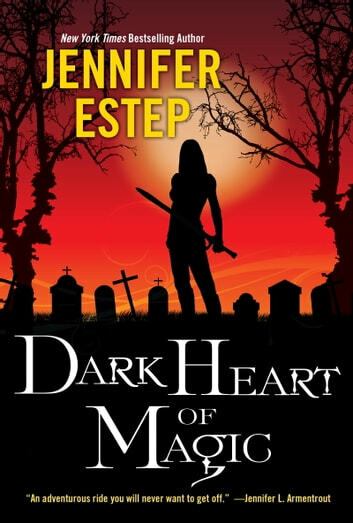 Dark Heart of Magic picks up a couple of weeks after Cold Burn of Magic ends, with Lila now working as Devon Sinclair’s bodyguard and a member of the Sinclair family. I love that Lila is really still more comfortable in the shadows than the spotlight, even though as a Sinclair, she really can no longer hide. Lila is such a strong character and I felt like she only grew stronger as the story progressed. The focus of Dark Heart of Magic was the Tournament of Blades. The annual tournament pits each of the families against one another in a winner take all competition. I enjoyed the Tournament of Blades portion of the story. It was fun to see the battles between the different family members occur in a controlled environment. Not that there weren’t issues with the tournament, as on the first day one of the ropes “accidentally” unwound with a number of the contestants still on the rope. Add in the various monsters being murdered around town, and Lila’s Spidey senses were going off. The tournament was very exciting and I loved reading about each of the battle scenes. We also learn more about the Draconi family, especially Deah and her mother Seleste. I honestly felt so sorry for Deah since she never seems to be good enough for her father Victor. However, since Victor and her brother Blake are really just big bullies, I wanted Deah to start seeing them for who they really are, no matter how hard it is for her to accept. The various romances that started in Cold Burn of Magic were really more back burner story lines. I loved that Deah got mad at Felix when she found out about him dating Katia Volkov the previous summer and not telling Katia up front he was dating someone else now. The simmering romance between Devon and Lila is also in the background through much of the story and I really love the realistic depiction of young love and all the drama it includes. 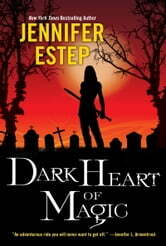 I have to say Ms. Estep gave her readers another great who-done-it with Dark Heart of Magic. I had my suspicions as to who was behind the murders of the town monsters and the humans, but I was completely wrong with my guess for the reason of the murders. Lila learned key information that will help her and the Sinclair family battle and win against Victor Draconi. I can’t wait to see how she uses the information to win against Victor. Bright Blaze of Magic, which is scheduled to come out in May 2016, is the 3rd book in the Black Blade series and should feature an epic battle between the Sinclairs and the Draconis. I liked this book but I didn't like it quite as much as I did the first book in the series. My 4 star rating is probably a bit generous but it is really a fun read. This book really has a lot going for it and the world that it is set in is amazing. I just love the combination of magic, monsters, and the mob that this world is built upon. This book picks up right where the first book in the series, Cold Burn of Magic, leaves off so I would recommend that this series be read in order. Lila has assumed her role as bodyguard to the Sinclair family bruiser, Devon. It is time for the annual Tournament of Blades competition. This competition will consist of selected members from each family facing off against each other until the champion is named. Lila doesn't know a whole lot about this tournament from her prior life as a thief but she may be the Sinclair family's best chance at winning. When some unusual things start happening, Lila works to try to find out what is going on through the use of her magic and the skills that she has developed from her work as a thief. The tournament was interesting and I liked that it allowed members from the different families to interact. Some of the characters from the other families are actually pretty interesting and others are just ugly to their core. The action during the tournament was exciting but not quite as exciting as the action that occurred outside of the tournament. There were a few twists and turns in this story which I really loved. Lila had grown as a character and seems a bit more sure of herself as she learns more about her parents' past. The only thing that bothered me about this book was the romantic pieces. I know that this is a YA novel and I am just an old lady but the romance felt so very young and was distracting at times. I do appreciate that the story is not centered on a love triangle but Lila's indecision regarding her feelings for Devon are becoming old. I kind of wanted to slap her so that she would either act on her feelings or stop thinking about it. I am hoping that the next installment will have some forward momentum in terms of their relationship even if it means that they don't have one...I just want someone to make a decision and quit talking about it. I would recommend this book to fans of Young Adult novels. This story is set in an interesting and creative world and there is a lot of action to keep things exciting. I have read several books by Jennifer Estep and plan to continue with this series when the next installment is released. I received an advance reader edition of this book from Kensington Books via NetGalley for the purpose of providing an honest review. Great second book in the Black Blade Series! I received an ARC from Netgalley via the publisher in exchange for an honest review. This is the second book in Jennifer Estep's YA-Paranormal Black Blade series. I have mostly read and really enjoyed her adult series, Elemental Assassin, but I took a chance with the first book in this series, Cold Burn of Magic, and I loved it! This one continued off where the first one left off and was equally as impressive. This is quickly turning out to be one of my favorite YA-Paranormal series. Lila is an amazing character and some of the bombshells dropped in this book will only make the series more interesting. Can't wait for more! From the first sentence I was in love.It was impossible to put dow and when i did all I thought about was it. I've really enjoyed the first 2 books in this series, until it reaches the revelation of the antagontist. I find there is plenty of foreshadowing and hints throughout the books alluding to who the villain is. When the author finally reveals it in the storyline, however, the explanation of the antagonist's motives are a little overdone since the reader has already been able to put most of the pieces together. Especially when the revelation is presented in such a way that the protagonist is still asking the antagonist for clarification of their motives. As a reader I assume that I have all the same information as the protagonist (especially if the story is told in a first person narrative). So for me to be able to figure out the direction of the plot before the leading character, makes her seem weak and incompetent. That being said, I'm still really enjoying the stories and look forward to reading the third book in the series. I'm certainly not trying to critique the author with this review or turn people off of reading this series. Just thought I'd give my two sense.